The all-conquering Ramjet is back! 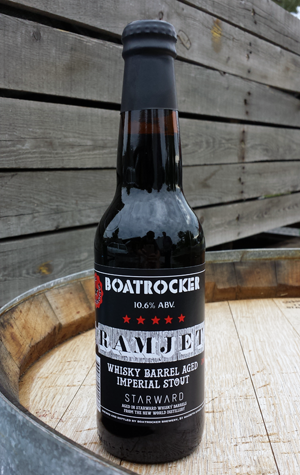 The first vintage of the barrel-aged imperial stout from Boatrocker wowed all beer lovers whose path it crossed, won over by its luscious blend of roast characters, chocolate, vanilla, oak and whisky. And now the 2014 vintage, which was offered to punters as a sneak peak at last month's Good Beer Week Gala Showcase where it promptly won People's Choice Best Beer, is out, initially in bottles and with a seriously limited number of kegs to follow between now and Good Beer Week itself (keep an eye on Boatrocker's social media for when and where, we're told). For the 2014 vintage, the story is similar to the first. Boatrocker obtained some just emptied (and in some cases not completely empty) whisky barrels from the Melbourne distillery that makes Starward whisky, brewed a batch of imperial stout and poured it into said barrels. A while later, the beer was put into bottles and left to age in the brewery's cellar for nigh on six months in keeping with the brewers' belief that, as The Supremes once sang, you can't hurry love.